Associated researchers are university professors seconded to IBEC with an agreement signed between their university and the institute who are working on topics that are of interest or complementary to our research areas. They participate in IBEC’s scientific strategy, academic activities and support initiatives, and have the option to submit project proposals and papers with IBEC affiliation. Recruitment is carried out according to several criteria such as scientific excellence and alignment with IBEC’s institutional strategy. Associated researchers are approved by the International Scientific Committee, which evaluates their performance on a regular basis. From 2008-2015, Alícia Casals led the Robotics group at IBEC. While at IBEC she began a spin-off company with the UPC, Rob Surgical Systems, which aims to develop a minimally invasive robotic station for surgery, Bitrack, and also worked alongside researchers at the Institut de Recerca de l’Hospital de la Santa Creu i Sant Pau and at the UPC on the development of Surgitrainer, a training platform for laparoscopic surgery. The group was awarded European funding for projects such as HYPER, which aims to develop new treatments in neurorehabilitation and help with patients’ mobility, and RecerCaixa funding for InHANDS (“Robòtica interactiva per a l’assistència humana en l’entorn domèstic”) and “Desenvolupament d un sistema robòtic de baix cost d ajut a la rehabilitació de la marxa per a nens amb transtorns motors greus”. Alícia was recognized for her work as a research scientist in the “16 Científiques Catalanes” exhibition being organized by the Associació Catalana de Comunicació Científica in 2010, and immortalised as a notable representative of the field of industrial engineering in the educational card game “La paciència és la mare de la ciència” by IEC’s Secció de Ciències i Tecnologia, and in 2015 she received a 2015 fem.talent Award at the fem.talent Fòrum in Barcelona. 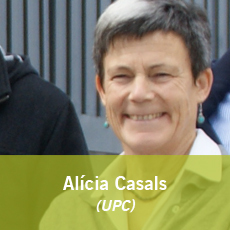 Prof. Casals’ contact information at the UPC can be found here. 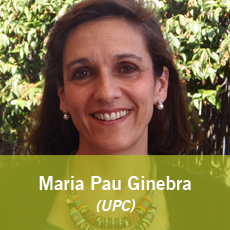 Maria-Pau Ginebra is Full Professor in the Department of Materials Science and Metallurgy and director of the Biomaterials Division of the Research Centre for Biomedical Engineering at the Technical University of Catalonia (UPC) in Barcelona, Spain, where she leads the Research group on Biomaterials, Biomechanics and Tissue Engineering. She has received numerous awards, amongst them the ICREA Academia Award in 2008 and 2013 and the Narcis Monutriol Medal in 2012 from the Generalitat de Catalunya, and the Racquel LeGeros Award, from the International Society for Ceramics in Medicine, for her contribution to calcium phosphate research, in 2013. Her research interests include the design and development of new biomaterials for bone regeneration, bone tissue engineering and drug delivery. Her research team has made significant contributions in the processing and characterisation of a new generation of calcium phosphate-based materials which mimic bone extracellular matrix, including calcium phosphate cements and foams, incorporating synthetic or natural polymers, and/or biologically active molecules. She is involved also in new biofabrication strategies, including injectable scaffolds for bone tissue engineering, bioinspired substrates and 3D printing of regenerative medical implants. She has been involved in numerous national and European research projects and participated in the organisation of scientific events in the area of biomaterials and bioceramics. She is author of more than 150 articles in peer-reviewed International journals as well as of 9 patents. In 2013 she founded the spin-off company Subtilis Biomaterials. Prof. Ginebra’s contact information at the UPC can be found here. From 2007-2015, Antonio Juárez led the Microbial Biotechnology and Host-pathogen Interaction group at IBEC. The group’s focus was the protein–protein and protein–DNA interactions that play key roles in the ability of virulent bacteria to adapt to the host environment and cause disease, with a particular interest in finding ways to tackle the resistance of bacteria to antibiotics. During his time at IBEC, he and colleagues from the UB and IRB identified the strategy used by enterobacteria to acquire resistance and pathogenicity (Baños, R.C. et al. (2009), PLoS Genet), and worked together with IBEC’s Nanoscale Bioelectrical Characterization group to demonstrate the potential of electrical studies of single bacterial cells (Esteban-Ferrer, D. et al., (2014), ACS Nano). The group also embarked on a technology transfer venture together with two biopharmaceutical companies, CZV Veterinaria and MEVET, to obtain strains of Salmonella with weakened virulence, which can then be used to develop a vaccine to reduce the incidence of the infection in poultry farms. 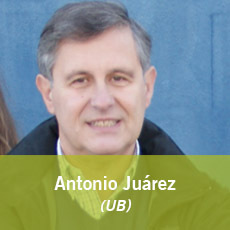 Prof. Juárez’s contact information at the UB can be found here. 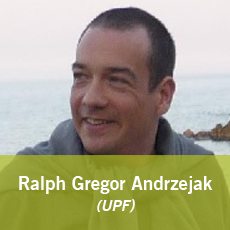 Ralph Gregor Andrzejak is director of the Nonlinear Time Series Analysis Group at the Department of Information and Communication Technologies at the Universitat Pompeu Fabra, Barcelona. His department has recently been awarded as a “Maria de Maeztu Unit of Excellence” by the Spanish Ministry of Economy and Competitiveness (MINECO). He pursues two parallel research tracks. On the one hand, he develops innovative nonlinear signal analysis techniques. These techniques aim, for example, at the detection of non-random structure in complex dynamics or the characterization of interactions in networks of dynamics. On the other hand, he applies these techniques to real-world biomedical signals. Here an emphasis is placed on different types of electrophysiological recordings from epilepsy patients. Prof. Andrzejak was born in Germany and has a degree and PhD in physics (University Bonn, Germany). During his career he was affiliated with the Neurophysics group of K. Lehnertz and C.E. Elger (Department of Physics and Department of Epileptology, University Bonn, Germany), the Neurodynamics research group of S.J. Schiff (George Mason University, Fairfax, USA), the Complex Systems research group of P. Grassberger (Research Centre Jülich, Germany), and the Computational Neuroscience group of G. Deco at the Department of Information and Communication Technologies at the Universitat Pompeu Fabra. Since 2011, he is a tenured associate professor at this Department. Some 60 publications of Ralph G. Andrzejak in leading journals of physics, neuroscience, neurology, and engineering are indexed in the ISI Web of Science. This work receives more than 2400 citations (h-index: 23; ISI Researcher ID: H-7923-2012). In Google Scholar the publications of Prof. Andrzejak reach more than 4500 citations (h-index: 30). He is principal investigator of several prestigious research projects receiving funding from Spanish, German and European Institutions. Prof. Andrzejak’s contact information at the UPF can be found here. 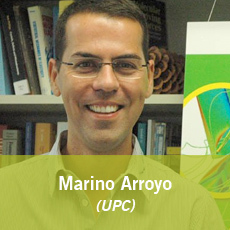 Marino Arroyo is Full Professor at the Universitat Politècnica de Catalunya (UPC), where he is a member of the Laboratory of Computational Methods and Numerical Analysis (LaCaN) group. Before joining the UPC, he obtained a PhD from Northwestern University, was a postdoctoral scholar at the California Institute of Technology (Caltech) and a long-term visitor at the Institute for the Mathematics and its Applications (University of Minnesota). He has been awarded the O. C. Zienkiewicz Award for Young Scientists in Computational Engineering Sciences by ECCOMAS (2010), two ICREA Academia Awards (2009, 2015), and the ASME/BOEING Structures and Materials Award (2003). He has also been the Timoshenko Visiting Scholar at Stanford. He was awarded a ERC-Starting in 2009 and a ERC-Consolidator Grant in 2016. In 2016 he came third, alongside IBEC group leader and ICREA research professor Xavier Trepat, in the La Vanguardia Science Award for their groups’ research that was published in Nature Materials. His research goal is to develop theories and computational methods to understand the small-scale mechanics of materials and biological systems, with a recent emphasis on cell and tissue mechanobiology and bio-inspired materials. Prof. Arroyo’s contact information at the UPC can be found here.